The trap won’t harm beneficial honeybees. It offers an easy way to control pests with no maintenance. It plays on the wasp’s instinct to avoid competition with other insects. Wasps and hornet present a formidable challenge. Getting rid of them is imperative, given the fact that they are often aggressive and can sting multiple times. That’s a concern if you or a family member are allergic to their venom. Symptoms can range from mild discomfort to life-threatening conditions. The sobering fact about these reactions is that about half of the affected individuals aren’t aware of an allergy to take the necessary precautions, according to the American Academy of Allergy, Asthma & Immunology. That’s a compelling reason to take action if you notice a problem before anything tragic happens in its wake. Traps provide a hands-off way to deal with an issue that minimizes your risk. Our Top 5 Best Wasps and Hornet Traps 2019 review runs down the products that will help protect you and your loved ones from these insects. They offer a safer way to get rid of them that doesn’t involve the use of sprays that can aggravate them and increase your chances of an attack. Keep reading to learn more about these options. How Do These Traps Work? 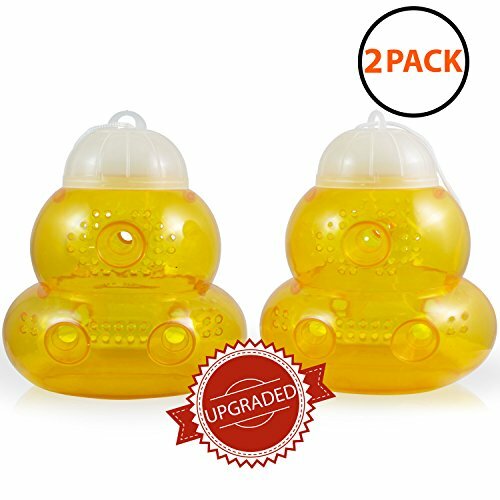 How Can I Avoid a Wasp or Hornet Problem? The RESCUE!! Non-Toxic Reusable Trap uses an insect-specific attractant to lure insects to it without the risk of hurting beneficial ones. The company’s laboratory tests each product to be sure that it works as described. You just hang it either around the perimeter of your yard or at least 20 feet from any area that people will use. It is reusable and easy to clean. The RESCUE! 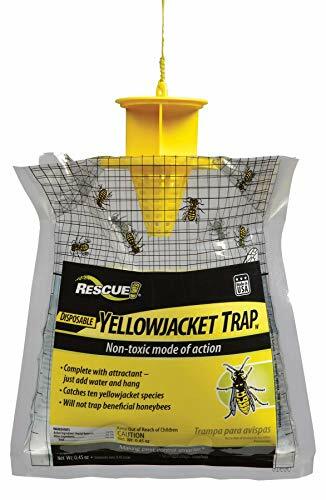 Non-Toxic Disposable Yellowjacket Trap works on the same principle as the previous product in a disposable form. When it gets filled, you just toss it in the trash. The difference with this one is that you need to add water to it before you hang it. The trapped insects drown in the solution. You don’t have to clean it or do any other maintenance. FMI Brands Inc. 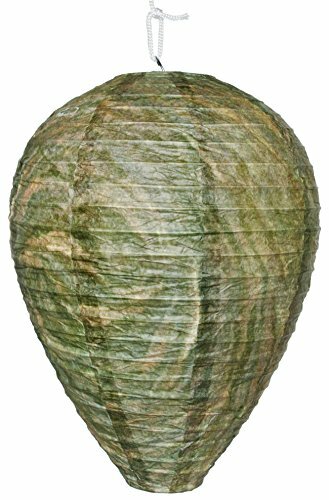 Original Get Lost Hanging Wasp Deterrent is the only decoy in our roundup of wasp and hornet traps. The product has a realistic appearance. It offers an excellent option for controlling these pests if you haven’t found the nest on your property. It’s essential to place it before they have taken up residence in your yard. It’ll help prevent them from building one and creating a nuisance. 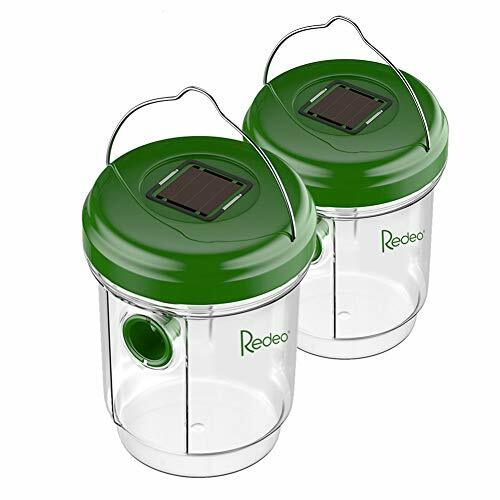 The Redeo Solar Powered Wasp Trap is a different riff on the previous products with the addition of a solar-powered UV light to make it even more attractive to pests. It doesn’t include an attractant. Instead, you need to fill it with a sweet liquid like soda, sugar water, or beer to do the job. It has a blue light that will stay on at night. You needn’t worry about changing batteries or the bulb which is a long-lasting LED. The Aspectek Wasp Trap, like the previous product, uses a homemade solution for attracting pests. A sweet solution of juice will lure them to it where they get caught inside and die. It’s a reusable model that you can use all summer long. It will also capture other insects such as flies. It’s a better value with two instead of just one product. These products work by luring the insects to them with the use of an attractant or prepared solution. Now that you know your options let’s review what you also need to understand about getting the most out of using a wasp and hornet trap. Keep reading to learn more about them and the best ways to avoid future problems with this menacing nuisance insects. These products work by luring the insects to them with the use of an attractant or prepared solution. Once inside, the wasps cannot get out and will die within the trap. Some are reusable whereas others are disposable once filled. When used as directed, they are effective and will keep the bugs away from you. Another option uses these insect’s territorial instincts to your advantage. They avoid building nests and setting up colonies in areas occupied by potential competitors for food sources. An artificial model can fool them and give the impression that another group has claimed your yard already. It’s simple, yet effective with the same benefits that conventional traps offer. Most of these products don’t contain any poisons, so there are no concerns about harming pets or children. The best application is to hang them which will also keep them out of reach. Since they attract the insects, we recommend placing them away from areas that people occupy. You should also make sure that all the bugs are dead before cleaning out reusable traps. There are several advantages to using them versus other options such as sprays. The traps are non-toxic and won’t harm other organisms when used as per the label’s instructions. They also offer a way to control these pests while minimizing your contact with them. They are the ultimate hands-off solution with less risk of getting stung. Most manufacturers recognize the concerns about harming beneficial insects such as honeybees. These companies create problems that will target the pest and not any other ones. You’ll see this information on the product label as it is often a major selling point. It’s possible with the traps that include an attractant or bait. Homemade preparations may not offer the same benefits. If you have honeybees in your yard too, you can contact a local beekeeper who can handle the problem for you without risking the safety of the colony. You’ll find it infinitely easier to prevent an issue than the challenge of getting rid of these pests. They become active as the weather warms. Toward the end of summer, there is less for them to eat, making them more visible and persistent. That’s why it’s essential to keep your garbage cans closed so that the food odors won’t attract them to your yard. You should also rinse them out periodically. The same precaution applies to water sources and even your pet’s food bowl which may also lure these pests. The good news is that you’ll also deter other unwanted visitors such as rodents or other wildlife. Wasps build large paper-like nests that you may see hanging in a tree. They may also use other areas for a base including gutters, sheds, or other cavities that can offer them some protection. They will occupy it until the weather turns cold. If you see a lot of them in your yard, the chances are there is one on your property or nearby. Never attempt to remove a nest. That’s a job for a professional. You may find it helpful to check for nests early in the spring when their populations are smaller and when it’s safer for you to manage. We’d also suggest setting out some traps later in the summer to catch any passing through your yard. Finally, give careful thought to the plants in your garden, especially flowers. Wasps and hornets prefer sweet-smelling varieties. You might consider choosing ones that bloom before these insects are active or others that bloom in the evening instead. These simple measures can go a long way to ensuring a pest-free home.